The oxidation reduction potential (ORP) of marine aquaria is a measure of the relative oxidizing power of the water. It has often been recommended to aquarists as an important water parameter, and some companies sell products (equipment and chemicals) designed to control ORP. Many who recommended ORP control have convinced aquarists that it is a measure of the relative "purity" of aquarium water, despite the fact that this has not been clearly demonstrated. ORP, at its heart, is very, very complicated. It is, perhaps, the single most complicated chemical feature of marine aquaria that aquarists will typically encounter. It is not hard just for aquarists who are not scientists. I had to learn a great deal about the electrochemistry of natural waters in order to write this article, and had help from a number of other chemists in understanding some of the principles that are usually swept under the rug. ORP involves many chemical details that are simply unknown, either for seawater or for aquaria. It involves processes that are not at equilibrium, and so are difficult to understand and predict. Even more daunting is the fact that the chemical species that control ORP in one aquarium might not even be the same chemicals that control ORP in another aquarium, or in natural seawater. Because of these complexities, this article is split into two parts: a simplified part and a detailed part. The first part explains what ORP is and why one might measure or control it, in terms that any aquarist can readily understand. It does not, however, explain any of the science behind ORP. It will be useful for aquarists that want a simple understanding of what ORP is in the context of a reef aquarium. The second half goes into great detail on the science behind ORP, including extensive discussions about what facts simply are not known. Many of the details in that part are important to truly understanding what ORP means to aquaria. Unfortunately, these facts have often been glossed over, or ignored entirely, by aquarists using ORP measurements. Such details will help aquarists better understand whether or not it is a good idea to control ORP, to understand the difficulties in attaining interpretable measurements, and to understand what ORP readings are actually telling them about their aquaria. Imagine a reef aquarium as a vast battlefield. No, more vast. Much, much more. OK, that's ORP. That is, ORP is a measure of who is winning and who is losing the battle. The battle is never won by one side or the other. As an aquarist, you do not want it to be, or else everything in the tank would be dead. In other situations, such as the purification of tap water for drinking, allowing the oxidizers to win is fine. A high enough ORP (650+ mv) can kill most bacteria in a few seconds. On one side of this aquarium battle there are the oxidizers. They all want to get electrons, and they rip them off of the bodies of the enemy. The foot soldiers of the oxidizers are oxygen molecules (O2). Did I say the battle is vast? On one day last week, there were 342,418,226,849,748,675,496,726 of these little guys roaming my aquarium, looking for action. Some of these are paratroopers, arriving at the aquarium out of the air. Others are made in secret labs, otherwise known as photosynthetic organisms such as many corals and algae. Unfortunately, despite their vast numbers, the oxygen molecules are not very effective fighters. In many cases, they can swarm all over the enemy and still not prevail. The true leaders of the oxidizers are far less numerous, but considerably more potent fighters. These include ozone (O3), hydrogen peroxide (H2O2), triplet oxygen (3O2), and a variety of oxygen radicals, some with such inspiring names such as superoxide radical (O2-). They also include chlorine (Cl2) and chloramine (NH2Cl). It turns out that oxygen molecules (O2) can occasionally morph into some of these better fighters (such as hydrogen peroxide), sometimes all on their own, but most frequently when they get blasted with UV light. The oxidizers also have other types of fighters. Some are present at very low concentration, but are so sensitive to the state of the battle, that one can gauge the battle by how many of them are left standing at any given point in time. Metals, for example, such as iron (as ferric ion, Fe+++) can serve this purpose. The other oxidizers also include anions such as hypochlorite (ClO-), iodate (IO3-) and nitrate (NO3-), among a host of others. On the other side are the reducers. The reducers all want to get rid of electrons, and they virtually throw them at the oxidizers. Many of these are organic molecules. They are not as numerous as the oxidizers, but many are much larger. Some are more than 10,000 times as large as an oxygen molecule. So they can make up for low numbers with pure brawn. That is not to say that the reducers do not have small but potent soldiers. The antioxidant vitamins, like vitamin C, for example, are small but extremely potent reducing agents. The reducers also number on their side some inorganic compounds, such as ammonia, iodide, and a really nasty fellow, sulfide. The reducers come from fish food, metabolic waste products, the breakdown of dead organisms, and certain additives put into the aquarium (e.g., iron supplements that contain ferrous ion). The surfaces of most organisms themselves enter the fray as reducers, waiting to be oxidized by the enemy. Interestingly, most soldiers on both sides are suicide attackers. Oxygen, ozone, and hydrogen peroxide are all destroyed when they react with a reducer. While not strictly suicidal, most organics are heavily damaged by oxidizer attacks, and are slowly degraded, eventually ending up as carbon dioxide if oxidized enough. They tend to be found in areas that the oxidizers hate; that is, in areas of low oxygen. Yet, the reducers are also sneaky, and even manage to get their hands inside cells (even finding positions in photosynthesis itself). So Where Does ORP Fit Into All This? ORP is a measure of the relative fighting ability of the oxidizers and the reducers. Think of the surface of the ORP electrode as a surface that these various fighters are hurling themselves against for practice. If there are lots of potent oxidizers around, and not so many reducers, ORP rises because the electrode senses more oxidizing "power" in solution. Likewise, ORP drops if it senses more reducing power in solution. The exact value reported by an ORP electrode is, consequently, a constantly varying number that represents the ebb and flow of the battle. If you add oxidizers to the aquarium (ozone, permanganate, hydrogen peroxide, etc.) then the ORP rises. Alternatively, if you add a lot of organic molecules to the solution, or restrict the oxygen supply, the ORP drops. What about pH? pH can impact the ORP readings in aquaria. 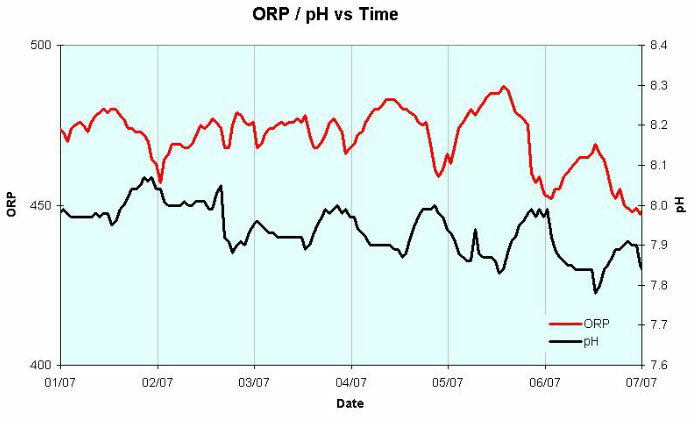 Often, ORP goes down as pH rises. A typical aquarium ORP reading will change on the order of 59 mv/pH unit. The easiest way to understand this is to simply think of pH as a measure of hydrogen ions (H+) in solution, and to think of H+ as being on the side of the oxidizers. In reality, H+ doesn't usually oxidize things itself (though it can), but more typically it can hype up other oxidizers, like oxygen, making them much more potent. 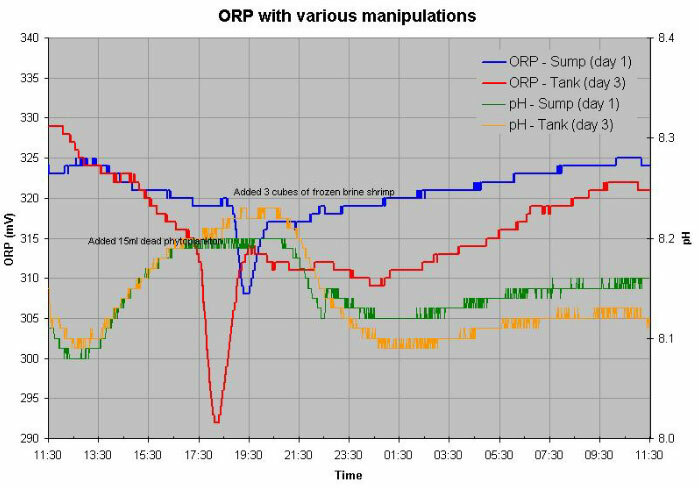 So during the course of a 24-hour day in a reef aquarium, ORP will vary as pH and O2 also vary. Is ORP a useful measure? That is, should aquarists really care how this incredible battle is going? To some extent, yes. If the oxidizers carry the day, the ORP would rise to the point where the organic molecules that represent the bodies of organisms would be burned away. If the reducers won outright, the ORP would drop below 0 mv. In that case, there would be little oxygen left, and toxic hydrogen sulfide would rule the aquarium. In either case, the aquarium would be a disaster. So aquarists have to hope for, and to some extent maintain, this battle in a sort of middle ground. That middle ground is typically described as being between 200 and 500 mv. Most aquarium authors have recommended a range of 300-450 mV. Why? Mostly because the ocean often has ORP in this range, and because these authors have successfully operated aquaria in this range. HOWEVER, there is a significant potential to misunderstand cause and effect with ORP. If a crappy looking tank that is overrun by algae has a low ORP, is the low ORP the cause of the algae, or is the algae the cause of the low ORP? Or are both simply the byproduct of some other process? Does artificially raising ORP by adding an oxidizer like ozone actually improve anything? The answers are not obvious. These and other related questions will be addressed in greater detail in subsequent sections of this article that go into the scientific details surrounding ORP in aquaria. Most reef aquarists, aside from those that use ozone and must therefore monitor ORP to prevent overdosing, use ORP to monitor if anything unusual happens in the aquarium. A sudden drop in ORP, for example, suggests that the reducers are suddenly gaining ground. That might be because a gush of organic molecules has been released from a dead organism, or because the oxygen supply is not keeping up with demand for some reason. Aquarists might use such information like an alarm suggesting the tank needs to be looked at closely. Most aquarists do not target any specific ORP value as being optimal, in part because ORP measurement is subject to considerable potential error. So is ORP measurement and control recommended for nonscientists who also happen to be reef aquarists? My suggestion is no. There are interesting things to learn by measuring ORP, and I recommend that everyone with any interest read the following sections to better understand it and decide for themselves if it is worth doing or not. Nevertheless, I have not measured ORP in my aquarium for years, despite having the tools at hand. It is simply not very high on the list of things that one can usefully do to maintain a high quality reef aquarium, in my opinion. As it turns out, the redox potential of the open ocean is not something that most oceanographers appear to pay much attention to. Chemical oceanography textbooks often don't even mention it. That is probably because it isn't an especially useful measurement for most of the features of the ocean that they are actually interested in understanding. ORP is also frequently used to evaluate interstitial water in sediments on the bottom of the ocean (often in the range of -200 to -400 mv). I've not measured the ORP down in the sand in my aquarium or refugium, although I have measured pH down deep in the sand, and it is well below the pH of the water column. I have also not seen such ORP measurements for other aquaria, but they could be very interesting. Perhaps such measurements could shed light on the aging of sand beds. Or perhaps on how deep a layer of sand is necessary to drive nitrification as a function of particle size. It might possibly even distinguish different types of sand (e.g., silica vs. aragonite). Those embarking on such tests should be aware of certain complications which will be discussed later in this article. Specifically, it may take a substantial period of time for an ORP probe to come to equilibrium with the ORP in a sand bed. Additionally, the act of inserting the probe will likely skew the ORP, so one may need to wait a substantial period (days or longer) for the sand bed to re-equilibrate. Other scientists have used small ORP changes in the open ocean as an indicator of possible hydrothermal vent activity below. Unless you are measuring ORP in sand beds, or some similarly unusual place, these types of measurements are probably of little interest to most aquarists. The ORP of the open ocean (and on coral reefs) has been reported to have values ranging from 0 to 450 mv.2-5 The fact that these values are very prone to error for a variety of reasons makes them not very useful in setting a target ORP for aquaria. These sources of errors are discussed more fully in subsequent sections of this article. Why Does the Ocean Have the ORP It Does? 1. Biological systems are continually adding and removing oxidizing and reducing substances to and from the water. These processes include production and consumption of oxygen, organics, and metals. 2. Physical processes are also continually adding and removing these substances. These processes include diffusion from the atmosphere, creation by reaction with UV light, precipitation and settling, and the sinking or upwelling of water masses. 3. Some of the reactions involved in determining ORP are fast, and may reach equilibrium in a few seconds. Others are inherently very slow, and may not reach equilibrium for thousands of years. ORP is a measure of the relative oxidizing and reducing power of a solution. In a sense, ORP is a measure of the relative ability of the solution to add or remove electrons (e-) from chemicals that might be added to the solution (or to an ORP electrode that is in the solution). If the solution is dominated by atoms, molecules, or ions that want to pick up electrons, then the measured ORP will be high. In a sense, they want to pull electrons out of the ORP probe, raising the measured voltage. Examples of oxidizing species are shown in Table 1. Table 1. Oxidizing species in marine aquaria. If the solution is dominated by atoms, molecules, or ions that want to get rid of electrons, then the measured ORP will be low. In a sense, they want to dump electrons into the ORP probe, lowering the voltage. Examples of reducing species in aquaria include most organics, iodide (I-), ammonia (NH3), ferrous ion (Fe++), and sulfide (S--). In an aquarium where all of these oxidizers and reducers are mixed together, one might think that they will react and reach equilibrium quickly. An analogous reaction is the reaction of acids and bases. Nearly all acids and bases in an aquarium will rapidly reach equilibrium, and that equilibrium is very well represented by a single value, the pH. Likewise for redox reactions, a steady state of electron pushing and pulling is reached, and that state can be represented by ORP. The analogy breaks down, however, because not all oxidizers and reducers are capable of reacting with each other (or the ORP probe) in a short period of time. Given enough time, for example, oxygen (as the oxidizer) will react with ethanol (the reducer) to form a variety of products, ultimately ending in carbon dioxide and water. That reaction is very slow, however, and might not happen at all over the lifetime of a reef aquarium. So, there is a subset of oxidizers and reducers that are actually capable of reacting with each other, and moreover for interpretation of ORP, in impacting an ORP electrode. Consequently, a single ORP value measured for a given aqueous solution may not correctly describe the relationship between any given pair of redox species in the solution.6 This complication is discussed further in subsequent sections of this article. In this case, two electrons have been transferred from one copper atom (Cu) to two ferric ions (Fe+++), producing one cupric ion (Cu++) and two ferrous ions (Fe++). These half reactions are what one looks up in textbooks to see how powerful the various chemicals are as oxidizers and reducers. What Redox Reactions Control the ORP in Seawater and Marine Aquaria? The nature of the redox reactions that control the ORP in seawater and marine aquaria is very complicated. It is not known exactly which chemical species control the ORP, and it is not an equilibrium situation, so all simple chemical equations will only be an approximation of what is taking place. However, the effect of the exact concentration of O2 is not very great. At twice the concentration of O2, the ORP only rises to 540 mv at pH 8.2. It also only drops to 531 mv when the amount of O2 is halved (also at pH 8.2). Why such a small dependence on the O2 concentration? There are actually two answers to that question, depending on what is really being asked. Why does the ORP not change more when the concentration of oxygen is changed so much? The simple answer is that equilibrium ORP is just not very sensitive to small changes in the concentration of oxygen. After all, ORP only varies over about 1000 mv from the most oxidizing to the most reducing environments found in natural waters. But the oxygen concentration might vary by a factor of 1050 or more. Keep in mind that ORP is logarithmic in the same sense that pH is logarithmic. If you double the [H+], pH only drops by about 0.3 pH units. In the same way, doubling the [O2] has only a fairly small effect on ORP. Why does the measured ORP vary so much in aquaria? Does that imply that the concentration of oxygen is varying by huge amounts as ORP rises and falls? Those are very deep questions into the nature of ORP in aquaria. The answer boils down to the fact that ORP is not at equilibrium in aquaria. There are oxidizers (such as O2) and reducers (such as organics) present together. That alone tells us that the system is not at equilibrium. So we cannot assume that any equilibrium relationships between the concentrations of these species and ORP will necessarily hold true. Since many species can potentially impact ORP in a reef aquarium, all that can be concluded from a change in ORP is that one or more of the redox species has changed concentration. For example, if the ratio of Fe+++ to Fe++ in solution suddenly doubled, then one would expect some rise in ORP. If these species were the only redox active species in solution, then the ORP would rise by 18 mv (the equation to derive this result is shown later). However, since there may be other redox active species present, these other species will likely blunt, if not totally swamp, the effect from that change in iron. This effect is exactly analogous to adding acid or base to a solution. If it is unbuffered, a large change in pH will be observed. If it is buffered, the change is much smaller. So too with redox. If the iron were alone, a large ORP change (18 mv) would be seen. But with other redox species ready to buffer the ORP, the rise may be much smaller, or even undetectable. The unfortunate circumstance with ORP, however, is that we do not have a good understanding of the redox active species in seawater and marine aquarium water. Consequently, unlike pH where buffering is readily understood, measured, and theoretically predicted, the effects of oxidizers and reducers on ORP is much harder to fully understand. What redox active species can contribute most to ORP in marine aquaria? Table 2 lists some possibilities, and the relative importance of each may well vary between aquaria with different concentrations of the various species. Other redox active species in aquaria include arsenic, copper, lead, chromium, mercury, and selenium, among others. One can look up the relative oxidizing and reducing power of all of these under standard conditions to get a rough idea of which will control ORP in seawater and aquaria. However, many of these form complexes with other inorganic and organic materials in seawater, and such complexes can have very different redox properties than the bare ions. Also, how important they are to redox control depends entirely on how much of each is present. Two of the primary contributors to ORP are going to be oxygen and organics. Since organics comprise a wide array of different species, it has proven impossible to say definitively what controls ORP in seawater. In the end, I expect that the ORP is kinetically controlled by a steady state of oxidation by oxygen and related species with the various organics in the aquarium. Some of the other species listed in Table 2 may also play important redox "buffering" roles. Table 2. Some oxidizers and reducers in marine aquaria. Since ORP is a measure of the electron "pulling and pushing" from the solution, it makes sense that ORP would be measured as an electrical signal. In other words, the chemicals themselves pull and push the electrons to and from a suitable probe, and the resulting voltage is a direct measure of the redox properties of the solution. ORP can be measured in other ways, such as with redox sensitive dyes, but that is rarely done by aquarists. The electrode that actually does the ORP sensing is usually an "inert" metal, such as platinum or gold. However, one cannot simply put a single electrode into a solution and expect to get anything useful because the voltage needs to be compared to something else. That is, voltage is always the electrical potential difference between two different points, not an absolute measure at a single point. So one needs a reference electrode that provides a constant "ground" with which to compare the electrical potential in solution. The standard hydrogen electrode is a probe immersed into a solution with a fixed concentration (activity) of H+ and H2. This reference electrode is arbitrarily defined as having a zero voltage. To make a measurement with a platinum redox electrode, one then measures the voltage difference between the platinum redox electrode put into your solution of choice, and this reference electrode put into its reference solution (plus an electrical connection between the two, usually provided by a salt bridge). The value measured in this fashion is often called EH. Unfortunately, the standard hydrogen electrode is cumbersome to use, and only specialized labs typically use them. Luckily, much simpler reference electrodes have been developed that are very easy to use. The one that is typically used for measuring ORP is the silver/silver chloride (Ag/AgCl) electrode. These electrodes are typically included in ORP electrodes, even if the manufacturer does not specifically say so. Consequently, all ORP readings taken by aquarists (and all values quoted in this article unless otherwise stated) are using this reference electrode. The potential for this reaction only depends on the concentration of chloride in the internal filling solution. Using a saturated potassium chloride (KCl) solution keeps the chloride concentration steady (at a given temperature), making this a good choice as a reference electrode. One then only needs a tiny electrical connection to the solution being measured to complete the circuit, and allow measurement of ORP using a platinum electrode. One difference between the Ag/AgCl electrode and the standard hydrogen electrode is that they do not have the same potential voltage. If they did, and the potential difference between them was measured, there would be no voltage difference. However, it turns out that there is a voltage difference of about 199 mv at 25°C. Consequently, if one wants to interpret ORP in terms of the EH, one has to add 199 mv to the ORP reading to get EH. ...In brief, rH has become an unmitigated nuisance." Nevertheless, many people still use rH. Since it is imbedded in many articles relating to aquarists, it is worth understanding where the pH dependence comes from, and why it is not always the same. As an example of a solution where the redox is not pH dependent, take a solution of Fe++ and Fe+++ in water, with no other redox active species. In that case, the ORP is exactly determined by the relative concentration of the two iron species, and is unchanged with pH. The main thing that is clear from this equation is that the ORP is independent of pH, and only depends on the relative concentrations of Fe++ and Fe+++. The easiest way to think of the lack of pH dependence here is to recognize that neither H+ nor OH- participate in the reaction at all. So changing the pH has no direct impact on the reaction. In this reaction, H+ does participate. Consequently, the oxidizing power is related to pH. As H+ is raised (by lowering pH), the reaction is driven to the right. One way to think of this is by LeChatlier's Principle where increasing the concentration of one species drives the reaction to the other side. In this case, lowering the pH increases the oxidizing power of the oxygen, and consequently raises the ORP. This result is the basis for the development of rH for many systems. It is beyond the scope of this article to go into the detailed mathematics behind the pH dependence of ORP measurements, but Pankow does cover such issues in great detail in Aquatic Chemistry Concepts.9 For our purposes, an important result is that the magnitude of the change in ORP with pH depends entirely on the number of H+ involved in the reaction per electron. In the case of the Fe+++/Fe++ situation, this value is zero. For the oxygen/water reaction, the value is 1.0. The standard definition of rH assumes that this ratio is exactly 1.0. Consequently, it may not apply to many redox reactions that take place in aquaria. and the ratio of H+ to e- is no longer 1.0, but is now 0.875. So if one really wants to understand how ORP would change with pH, one would have to know what the species are in aquaria that control redox. If it is a mixture of species, then the end result will come back as a complex averaging of the different reactions involved. Unfortunately, the species involved have not been clearly defined for seawater. In aquaria, which vary considerably in the concentrations of many redox active species, the situation is even more complicated. 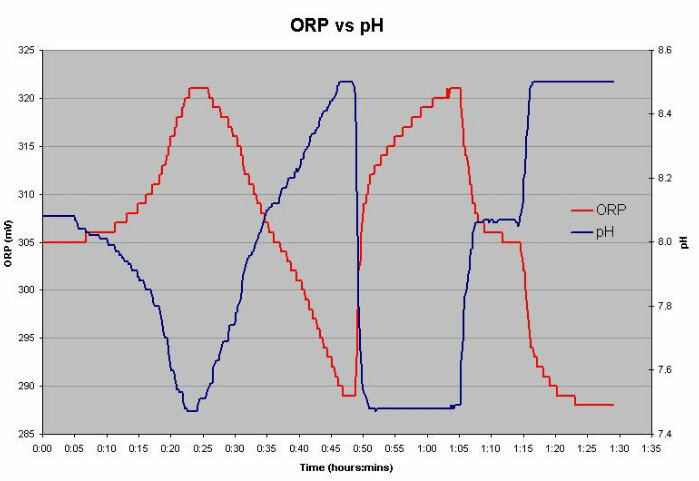 While understanding the details of the theoretical relationship between pH and ORP is complicated, measuring it for a single aquarium is fairly easy. Figure 1 shows simultaneous plots of pH and ORP values over the course of several days in the aquarium of Simon Huntington. 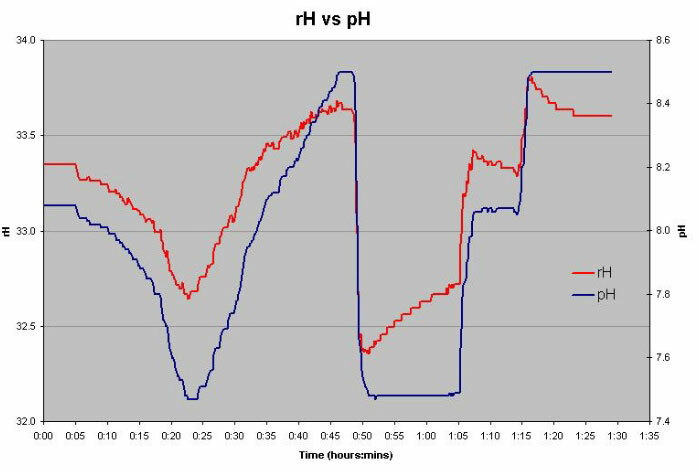 Clearly, the measured ORP and the pH are on exactly opposite cycles, as one would expect from a system where reactions involving oxygen are important (and as is shown by rH). 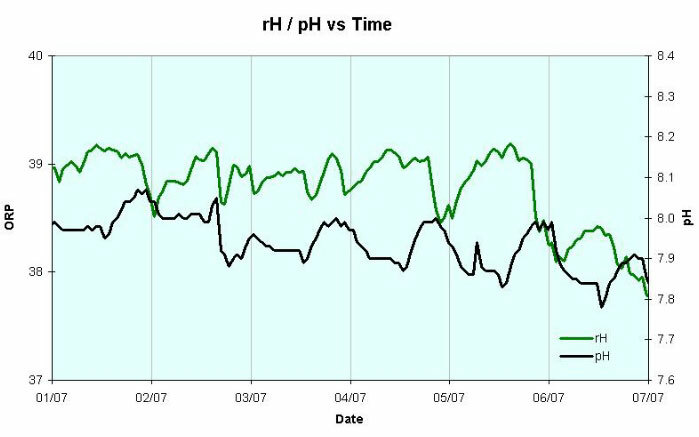 Figure 1. pH and ORP as a function of time for 6 days in the reef aquarium of Simon Huntington. then one might expect rH to not have a diurnal cycle. In this figure, the data suggest that there is still a diurnal dependence to rH, possibly due to pH effects. I have seen data from other aquaria as well, and in those cases the same holds: that rH largely compensates for ORP changes with pH, but not perfectly. Since things other than pH (such as O2) may change during the night and day in aquaria, this experiment may be confounded by these other variables. Figure 2. pH and rH as a function of time using the same data as in Figure 2. Simon also ran an additional experiment on his aquarium. He took a water sample, and added either sulfuric acid or sodium hydroxide to it to adjust pH. In this experiment, the other factors that might cycle diurnally in an aquarium are constant. The results are shown in Figures 3 and 4. The fact that the ORP goes almost exactly back to where it was at the start, despite the pH excursions, suggests that the acids and bases are not altering the "base" ORP, but are only impacting ORP through pH. The ORP moves inversely to pH, as expected (Figure 3). But, the fact that the rH is generally not flat as the pH is changed (Figure 4), but rather tracks with pH changes, suggests that the mathematical conversion used (rH = mV / 29 + (2xpH) + 6.67) is overcorrecting for pH changes. That result in turn implies that the pH dependence of ORP may be less than predicted by the H+/e- ratio of 1.0. Perhaps this result indicates that in Simon's aquarium, some reactions with an H+/e- ratio below one are important in controlling ORP. Overall, my suggestion for aquarists using ORP measurement devices is to be aware of how pH can influence ORP measurements, but to not overly emphasize specific pH corrections. Figure 3. pH and ORP as a function of time during the addition of sulfuric acid and sodium hydroxide to a sample of Simon's reef aquarium water. The first 20 minutes represent a slow addition of acid followed by 25 minutes of slow addition of base. At 50 minutes a single dose of acid was added. Single doses of base were added at 65 and 75 minutes. Figure 4. pH and rH as a function of time using the same data as in Figure 3. Additionally, as soon as bacteria grow on it, they can lower ORP be reducing the local O2 concentration. Likewise, if the probe is in a lit area, algae can coat it and release O2 locally onto the platinum. The end result is a greatly increased ORP. Occasional cleaning eliminates some of these concerns, but because of these issues, one should not put too much emphasis on the precise ORP readings in any given aquarium. Many ORP meters do not permit calibration, but some do, and for detailed ORP measurements, including situations where ORP is being controlled (such as when using ozone), it is worthwhile calibrating (or checking the proper operation of) the meter. Usually, the calibration is quite easy given commercial ORP standards. A variety of standards are available, including Zobell solution which can be obtained from Cole Parmer for $21. It is a solid that is reconstituted from deionized water, and has an ORP of 231 ± 10 mv. Another common standard ORP solution involves putting quinhydrone into pH 7 and 4 calibration solutions to make standards of 86 and 263 mv, respectively. A third standard is Light's solution, which uses the Fe++/Fe+++ reactions described above. It is beyond the scope of this article to provide any details of using ozone in aquaria. Nevertheless, the use of ORP measurements is critical to ensure that the aquarium is not being overdosed with ozone. If the ORP were to rise too high, many tank organisms will begin to suffer considerably. I don't use ozone, or generally recommend it for a variety of reasons, but if I did use it, I would definitely have the ozone on a controller that shut the unit down if the ORP rose above some predetermined value. Setting the shut down at 450 mv sounds like an appropriate precaution to me, with the aquarium typically operating at 350-450 mv. There are a variety of uses for which an aquarist might use ORP. One of these is to use ORP as an "alarm" to alert the aquarist that something undesirable might be happening in the aquarium. Specifically, if something large died in the tank, and especially if it is out of sight, it might be useful for the aquarist to be alerted to the condition before water quality degrades to the point of killing other organisms. In this case, one would look for a significant decrease in ORP that was not resolving itself in a few hours. Simon Huntington suggested that one might be able to detect coral or macroalgae spawning events via ORP. That sounds logical, but as of this writing, he has not monitored one closely enough to say for sure that it works. One can also monitor the effects of more mundane events, such as feeding. Usually these effects are small and quickly disappear. In one recent test (Figure 5), Simon showed that feeding brine shrimp and phytoplankton depressed the ORP in his aquarium by about 10 mv and 20 mv, respectively. In each case, the ORP recovered in an hour or two. Figure 5. pH and ORP as a function of time during two 24-hour periods in Simon's reef aquarium water. Frozen brine shrimp and dead phytoplankton were added where indicated. Many aquarists have been lead to believe that ORP is a measure of water quality or purity. Manufacturers selling ozonizers and other oxidizers (like permanganate) have been especially keen to present that idea. But is it really true? Is a higher redox indicative of "purer water" even when that redox is manipulated artificially by adding strong oxidizers? Or is such an addition analogous to an air freshener that masks odors? I don't know the answer, but I think that aquarists should ask the question, and hope to hear useful answers before adding such materials to their aquaria. Obviously, one can decrease the yellowing of water fairly quickly with oxidizers. It turns out, however, than many organic functional groups that provide color are just the ones that are readily oxidized. It is a common trick for organic chemists that need organic compounds to lack colored impurities to add an oxidizer that "kills off" the color in certain impurities, but leaves nearly all of the primary organic compounds behind. I've done it myself when making dyes for photographic film. You don't want the film to be yellow, so an oxidizer is added to the dye, let it oxidize the color away, and then use the unaffected dye in the film. Of course, that decolorizing itself can be viewed as beneficial, but it is not necessarily indicative of the load of organics that have been removed from the solution. It is also not necessarily indicative of an improvement for tank inhabitants. The oxidizer did something to the organics. Maybe they are less toxic in the oxidized forms. Or maybe they are more toxic. Or perhaps they are not toxic regardless of the form. Maybe they are more readily metabolized by bacteria. Is that a benefit? The point is that assuming that such a treatment is of significant benefit to the aquarium may be in error. If an oxidizer is added and ORP goes up in 30 seconds, is the water purer? Not likely. More likely, that addition shifted many of the redox species to their more oxidizing forms. Is that beneficial? Maybe. Is it detrimental? Maybe. For example, the bioavailability of certain metals may depend on the form that those metals take. Is increasing bioavailability of them desirable? It all depends on the details. Details that are simply not known for aquaria. Perhaps continual use of ozone does help clear some organics from the water, and there is a long term benefit that may or may not be related to actual ORP readings that one gets from an aquarium. Is there data showing that to be the case, and then coupling that with some objective measure of benefit to the aquarium? Does that outweigh the potential concerns about the toxicity of reactive oxidants in aquaria? Again, I do not know the answer. Only careful studies with clear endpoints can give such an answer. ORP is an interesting, if complicated, measure of the properties of water in a marine aquarium. It has uses in monitoring certain events in aquaria that impact ORP but may be otherwise hard to detect. These events could include immediate deaths of organisms, as well as long term increases in the levels of organic materials. Aquarists that are monitoring ORP in an aquarium, and are doing things that otherwise seem appropriate for maintaining an aquarium (such as increasing aeration, skimming, use of carbon, etc.) may find monitoring ORP to be a useful way to see progress. ORP measurements are very susceptible to errors. Aquarists are strongly cautioned to not overemphasize absolute ORP readings, especially if they have not recently calibrated their ORP probe. Rather, the most useful ways of using ORP involve looking at changes in measured ORP. Some aquarists use oxidizers to raise ORP. Those additions may be of benefit in some aquaria, and they may be beneficial in ways that aren't demonstrated by changes in ORP alone. I've never added such materials to my aquarium. In the absence of convincing data otherwise, such additions seem to me to have more potential risk than is justified by the demonstrated and hypothesized benefits. 1. Determinations of the oxidation-reduction potential in Black Sea water. Skopintsev, B. A.; Romenskaya, N. N.; Smirnov, E. V. Okeanologiya (Moscow, Russian Federation) (1966), 6(5), 799-806. 2. Sea Water Under Test; The Maldives Example. Kipper, Horst. Today's Aquarium. 3/87: 21-23. 3. The Reef Aquarium. Delbeek, J. Charles; Sprung, Julian 1994 Ricordea Publishing. Part 1, Section 2, Report 3. The Progress Report of the 1999 Survey of the Research Project "Social Homeostasis of Small Islands in an Island-zone"
9. Aquatic Chemistry Concepts Pankow, James F. (1991), 673 pp.